This year, WEF was treated to a rare panel discussion bridging the fields of astronomy and music. 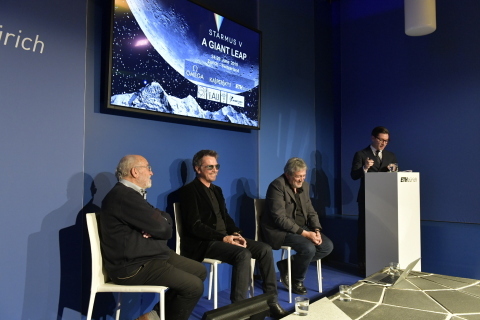 Global CEOs and international media had the opportunity to hear from Dr. Brian May, Jean-Michel Jarre and Dr. Garik Israelian discuss STARMUS and the special connection between science and music. Flanked by a panel of renowned scientists, astronauts, and Nobel laureates, Jean-Michel Jarre introduced his groundbreaking tribute to the Apollo Missions for their 50th Anniversary. Jean-Michel Jarre will headline a concert with “star sounds” never before heard here on earth. In addition to astronaut Michael Collins joining as the keynote, STARMUS V will host a remarkable line-up of presenters hand-selected by the STARMUS board (Stephen Hawking posthumous, May-Brit Moser, Elizabeth Blackburn, Linda Buck, Brian May, Peter Gabriel, Richard Dawkins, Alexei Leonov, Jill Tarter, Robert Williams, David Eicher, Emmanuelle Charpentier and founder, Garik Israelian). The 2019 festival STARMUS V will also feature seven of the original Apollo Mission crew, science legend and champion Bill Nye along with rock stars Brian May, Brian Eno, Steve Vai, and Rick Wakeman. Other speakers include Sir Martin Rees, Brian Cox, Emmanuelle Charpentier, and Helen Sharman.